Plus 10 workout ideas that I believe are more effective and fun! However, don't say that I didn't warn you that you were wasting your time with all that mindless cardio machine boredom. If I haven't mentioned it before, I don't believe in cardio machines, and to be quite honest, I don't think I've personally used a treadmill, elliptical, or exercise bike for at least the last 10 years or so. As a matter of fact, I don't even use cardio machines anymore for warmups before a workout (I did before occasionally)... Nowadays, I prefer to do dumbbell or kettlebell snatches and swings mixed with bodyweight exercises as the perfect full body warmup at the beginning of my workouts. 1) Treadmills, ellipticals, and exercise bikes are mind-blowingly BOOOORING! Personally, I can think of a million things I'd rather be doing than pedaling my way to nowhere ! 2) Mindless steady state cardio exercise while watching TV or reading creates a mind / body disconnect resulting in poor results from your exercise routine. Instead of reading a gossip magazine or watching a cheesy reality TV show on the TV screen in front of the cardio machine, a REAL workout consists of actually having your mind engaged strongly in what your body is doing! 3) I've seen studies that indicated that treadmill running may be less effective than outdoor running for various reasons such as stride abnormalities on treadmills vs natural running, slightly less caloric burn compared to outdoor running, etc. ...although I never recommend just "jogging" anyway (or as Ron Burgundy would say, "yogging") ... Instead, variable intensity walks / runs or sprints are so much more effective, training your heart rate in a much wider range instead of just the same pace during the entire workout. I choose to do a lot of hiking up mountains and also sprinting, but never steady state jogging. 4) Treadmills and ellipticals are ridiculously expensive and a waste of money for people that workout at home... there's so many better options for home workouts you could have spent your money on rather than wasting it on a treadmill, bike, or elliptical. The perfect home gym setup is MUCH cheaper... there's no reason you need anything other than a jump rope, bodyweight exercises, a few dumbbells, stability ball, maybe a few kettlebells (if you want to get fancy), and perhaps high tension bands for some more variety. And of course... the great outdoors has some of the best workout options of all... hiking, mountain biking, kayaking, skiing, sports, and more! jumping rope - great mind-body connection - try speed jumping, crossovers, and double jumps once you get skilled at it. An amazing metabolic exercise with one of the cheapest pieces of equipment available. There's a reason that every world class boxer uses this exercise! kettlebell training - nothing will get your heart pounding like high repetition KB swings and snatches or clean & presses (can be done with dumbbells too, but I prefer KBs). Personally, I think one of the most intense body changing exercises ever invented are double kettlebell snatches (snatching both kettlebells at the same time overhead from the floor). outdoor wind sprinting (the ultimate exercise for a rock hard ripped body... just look at the chiseled powerful bodies of world class sprinters, and compare that to the weakling withered physique of a typical marathoner... nuff said! I generally do wind sprints 2-3 days a week during the warm times of the year, and I'll do something such as 50 yards, 60 yards, 70 yards, 80 yards, 90 yards, 100 yards, and then repeat (with about 40-60 second rests between sprints). By the way, for the international folks, a "yard" is just slightly shorter than a meter. hill sprinting - yet another classic exercise for a rock hard lean and powerful body! I like to do 30 yard sprints up a steep hill and then walk down and repeat a bunch of times for maybe 20-30 minutes. Amazing workout. The rowing machine - ok, I don't really lump this in as a "cardio" machine like treadmills and ellipticals... I think the rowing machine is actually a great full body workout that actually uses resistance... The best results come from using variable speeds and really pulling hard to challenge your body. Sprint style swimming workouts - a more muscular workout than steady state distance swimming... I actually love the upper body pump I get from sprint style swimming -- this is the same concept as sprinting vs jogging but in a pool instead. It's all about intensity! heavy bag punching / kicking workout, speed bag, rebound bag - all are great forms of training and much more interesting than boring cardio machines. These exercises are also great examples of exercises that require an intense mind-body connection , which is missing in boring cardio equipment like treadmills and elliptical machines. shadow boxing - This is an awesome workout, but if you're shy, this is best saved for your home workouts since you'll get some crazy stares doing this at a typical gym from people who think they're "too cool" for stuff like this. dumbbell circuits -- This is a super metabolic type of workout that involves alternating between various full-body multi-joint exercises to get a crazy fat-burning workout in minimal time. A good example would be alternating between dumbbell lunges, overhead presses, bent over rows, step ups, and squat presses all with minimal rest between. bodyweight training - bodyweight squats, pushups, lunges, jumps, bear crawls, mountain climbers and jumpers, planks, and the list goes on and on. Another example of great mind-body connection and much more metabolic type of training than treadmills and ellipticals. My fitness buddy, and world class trainer, Adam Steer has some extremely unique bodyweight exercises formulated into awesome fat-burning workouts here . Well, I hope this article helps give you ideas on how you can get away from all of these mindless and ineffective treadmill and elliptical trainer machines (and exercise bike) workouts that are just wasting your time and energy that could be better spent on more effective workouts. 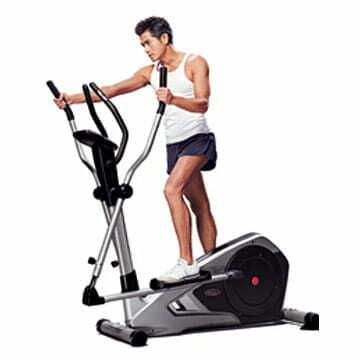 If you want maximum results, it's all about your intensity levels and also your mind-body connection... and that all important mind-body connection is usually missing when it comes to elliptical and treadmill workouts, that most people do while watching TV or reading. Remember to try out these awesome killer bodyweight exercises from world class trainer Adam Steer!